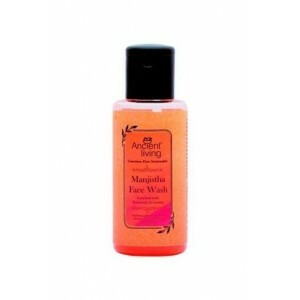 Wow Apple cider vinegar foaming face wash is a gentle, mild, cleanser which protects skin from acne and pimples. 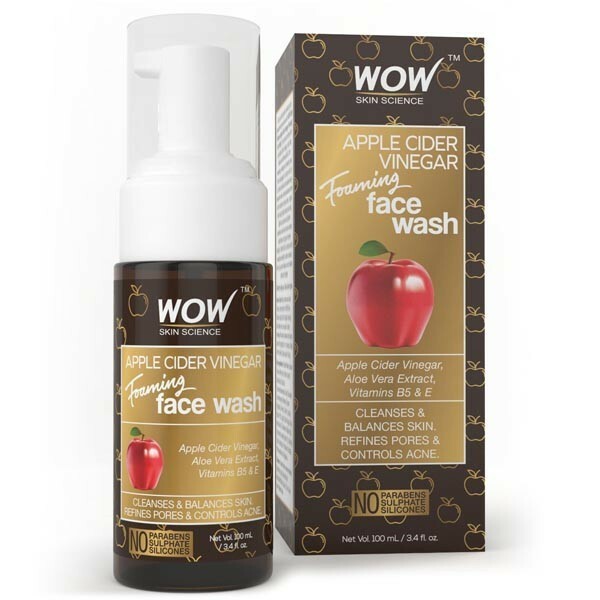 Wow Apple cider vinegar foaming face wash is developed with pure apple cider vinegar, aloe vera extract and vitamins b5 and e for cleansing deeply, healing and hydrating the skin. 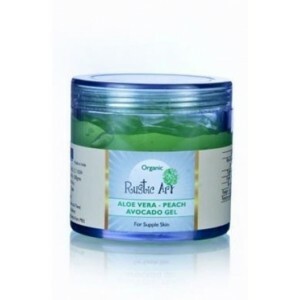 Aloe vera in it helps to keep soft and supple skin. 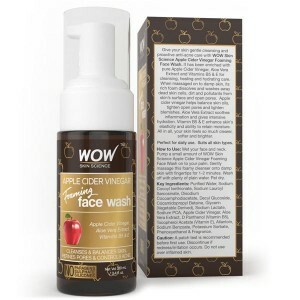 Product Description: Wow Apple cider vinegar foaming face wash is a gentle, mild, cleanser which protects skin from acne and pimples. Wow Apple cider vinegar foaming face wash is developed with pure apple cider vinegar, aloe vera extract and vitamins b5 and e for cleansing deeply, healing and hydrating the skin. 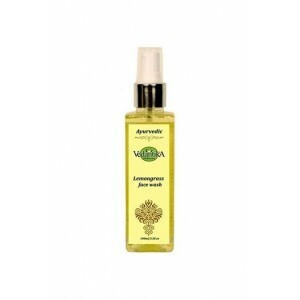 Aloe vera in it helps to keep soft and supple skin. Ingredients: Purified water, sodium cocoyl isethionate, sodium lauroyl sarcosinate, disodium cocoamphodiacetate, decyl glucoside, cocoamidopropyl betaie, glycerin (vegetable derived), sodium lactate, sodium PCA, apple cider vinegar, aloe vera extract, D panthenol( vitamin e), allantoin, sodium benzoate, potassium sorbate, phenoxyethanol and fragrance. 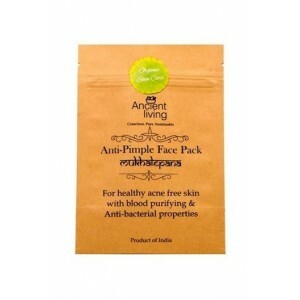 Benefits: This face wash is prepared with 100% natural bio-actives. It helps to reduce active breakouts and prevents future breakouts. Apple cider vinegar is well known to kills bacteria, eliminates excess dirt oil and removes makeup and reduces dead skin cells. Natural vitamin e oil in this face wash helps in repairing damaged skin, heals scars, fades blemishes and eases redness, no parabens, sulphate or silicones. 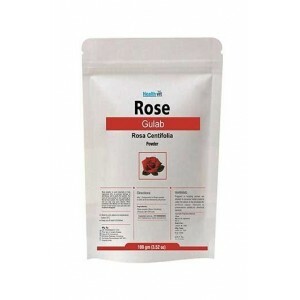 This face wash is suitable for all types of skin. The aloe vera extract in this face wash helps to soothe inflammations and provides an intensive hydration to the skin. Direction for use: Wet your face and neck with water. Take a small amount of wow skin science apple cider vinegar foaming face wash on to your palm and gently massage with this foamy cleanser with fingertips for 1-2 minutes. Rinse it off with plenty of plain water. 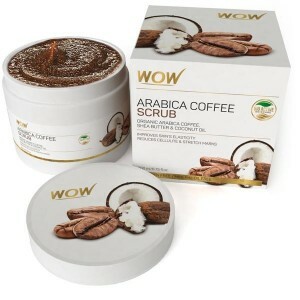 Best for acne and pimples. 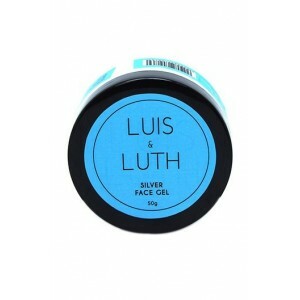 Luis and Luth Silver Face Gel 50g.